A greater awareness of the presence of lions. No studies have been done to determine what to do if you meet a lion. However, based on observations by people who have come upon lions, some patterns of behavior and response are beginning to emerge. With this in mind, the following suggestions may be helpful. Go in groups when you walk or hike in mountain lion country, and make plenty of noise to reduce your chances of surprising a lion. A sturdy walking stick is a good idea; it can be used to ward off a lion. Make sure children are close to you and within your sight at all times. Talk with children about lions and teach them what to do if they meet one. Stay calm when you come upon a lion. Talk calmly and firmly to it. Move slowly. Check out the "Moun​tain Lion Safety" video at the top of page for more tips on dealing with lion encounters. 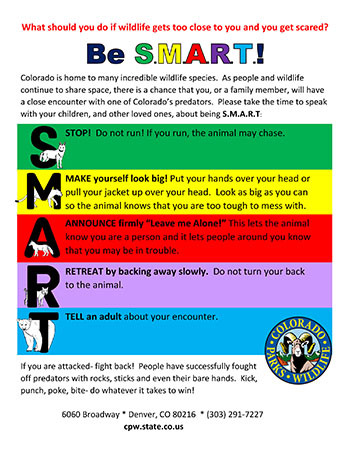 Colorado Parks and Wildlife is responsible for managing, conserving, and protecting wildlife. Your concerns about wildlife are our concerns as well. If you have an encounter with a lion or an attack occurs, immediately contact the Division of Wildlife, Monday through Friday, 8am-5pm, as listed below. Before or after these hours, contact the Colorado State Patrol or your local Sheriff's department. To report a sighting, please contact the Division during normal business hours. Your information is very valuable to us. 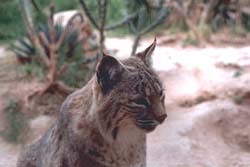 We can live with these incredibly efficient predators if we respect mountain lions and their habitat. 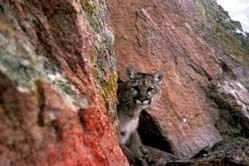 ​Make lots of noise if you come and go during the times mountain lions are most active: dusk to dawn. Landscape or remove vegetation to eliminate hiding places for lions, especially around children's play areas. Make it difficult for lions to approach unseen. Planting non-native shrubs and plants that deer often prefer to eat encourages wildlife to come onto your property. Predators follow prey. Don't feed any wildlife! Keep your pet under control. Roaming pets are easy prey and can attract lions. Bring pets in at night. If you leave your pet outside, keep it in a kennel with a secure top. Don't feed pets outside; this can attract raccoons and other animals that are eaten by lions. Store all garbage securely. Download and print the Living With Lions brochure and share it with your family, friends, and others in your neighborhood. It contains much of the information from this page and the next, and is a handy reference and reminder for anyone living in lion country. 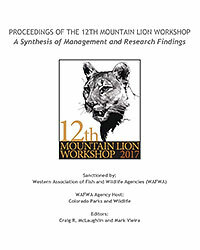 Proceedings of the 12th Mountain Lion Workshop​, which Colorado hosted in Estes Park in May 2017. It is a WAFWA sanctioned workshop, so the proceedings reflect jurisdiction updates from all western states and provinces on lion management, as well as the abstracts from all papers given and posters presented at the workshop. These proceedings are also published on the WAFWA​ workshop webpage.